Jazz guitarist Tom Conway has a new album out that showcases his passionate, amazing guitar playing. It’s so exciting to listen to. 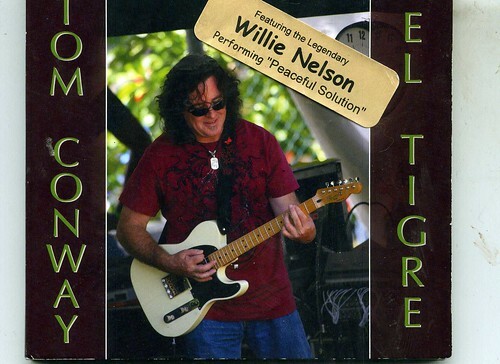 The album, ‘El Tigre’, is a collection of sixteen original, gypsy jazz inspired songs, all composed by Tom, plus one Willie nelson song, ‘A Peaceful Solution.’ Willie wrote this song with daughter Amy Nelson, and he sings and plays guitar with Tom on the song. It’s the perfect first cut for Tom’s beautiful album. Playing with Tom are musicians Marcus Johnson, on bass, David Choy, on Saxaphone, Mark Johnstone, organ, Willie Wainwright, violin, Greg Marsh, drums and percussion, Phil Benoit, rhythm guitar. Tom Conway’s furious guitar playing is brilliant, and his fellow musicians are as talented and as engaged in the music as Tom is. They all worked so hard on this album, and you can hear how much fun they are having and how much they love playing this music together. The first I ever heard of Tom Conway was when Willie Nelson was talking about him to Bill Mack on the radio one day, about a guitarist on Maui who shared his appreciation of Belgian guitarist Django Reinhardt and his all acoustic Quintet of the Hot Club of France. Willie has often talked about the influence Django Reinhardt has had on his own guitar playing , and he and Tom have both acknowledged the debt guitar players owe Reinhardt for his revolutionary contributions to music and jazz. 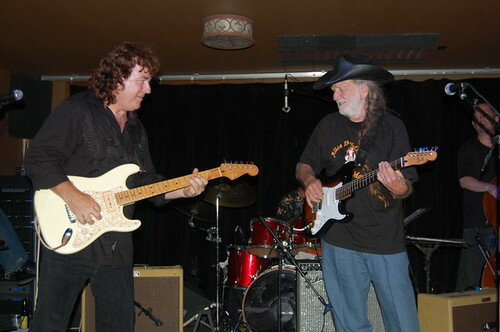 Willie told Bill that he and son Lukas once took a guitar lesson from Tom in Hawaii. But you don’t have to know anything about Reinhardt, the Hot Club of France or gypsy jazz to be blown away by this album. Tom’s original songs tell beautiful stories, and listeners are taken on a whirlwind journey. The title of the album’s songs give you a hint about where you’re going: “Dutch Treat” “Seven Southern Bells, ” “Bayou Beatnik Blues,” and there’s one titled, ‘Area 51,’ named, I think, after the secret military base/UFO alien repository on the Nevada desert. I told you, this album take you places! There is so much excitement and energy in this album. Tom pulls you along and draws you deeper and deeper into this jazzy music. El Tigre is a great way to experience the music stylings of Django Reinhardt and acoustic Quintet of the Hot Club of France, an excellent introduction to one of the most original styles of jazz and music, and will leave you wanting more. This album is solidly entertaining throughout. I’ve been playing it for my friends, and everyone goes, ‘Wow, who’s that?.’ Tom plays the guitar so fast, double time; his fingers fly, creating all these sounds. And he makes every note count. When I first played it, I stared at the stereo speakers, I couldn’t believe all the guitar sounds I was hearing. Tom has been playing and studying guitar since he was nine years old and all that dedication and hard work is reflected in this album. After high school, he formally studied guitar in Los Angeles, which involved practicing between six and eight hours a day. Tom has launched a new website, and his album, ‘El Tigre’ is available for purchase at his site: hhtp://www.TomConwayGuitar.com. The album is also available for purchase and download on itunes. You can buy Tom’s earlier albums at his website, as well, which I know you will want to do after you hear this album. 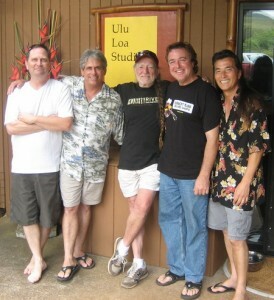 Lucky folks who live on Maui can see Tom Conway perform; he plays regularly at clubs around the island, and you can see his schedule at www.TomConwayGuitar.com. This entry was posted on Wednesday, May 12th, 2010 at 1:02 am and is filed under Albums, Duets and collaborations, Tom Conway. You can follow any responses to this entry through the RSS 2.0 feed. You can leave a response, or trackback from your own site. Ive had the honor to work with Tommy on several of his projetcs. Tommy is one of Hawaii’s most respected guitar players and this album of originals is a great example of how important Tommy is to this genre of music! If you are ever on maui be sure to look tommy up. Much Respect Tommy!